Look to Evoqua for your filter press needs for a wide number of applications. From high solids mineral processing applications to conventional industrial waste sludges, to lime softening residuals, we have equipment to meet your dewatering needs. Evoqua can also customize a cost-effective preventive maintenance program for your specific equipment, application, and environment that translates into lower maintenance cost and years of worry-free operation. Lab testing available. Filter presses are sometimes called "Plate-and-Frame Filters." This refers to the style of filter element that was most prominent in the mid 1800's until the late 1960's. 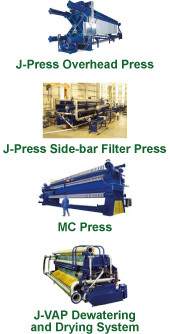 While this specialized style of the filter press is still manufactured today, the current manufactured units are more accurately referred to as "Recessed Chamber Filter Press” and/or “Diaphragm (Membrane) Filter Press". Greater savings are realized with the addition of the J-Mate dryer, designed as a second stage dryer for further reduction after mechanical dewatering. The J-Mate Dryer takes over where the filter press, belt press and centrifuge leave off.